This month's Reading to Know Book Club readers are focusing on Little Women, by Louisa May Alcott. I'll be reading that (this week!) but I also wanted a chance to read an Alcott book that I had not yet made friends with. About a year ago I picked up a used copy of Under the Lilacs and figured this month provided a good excuse to finally get to it! 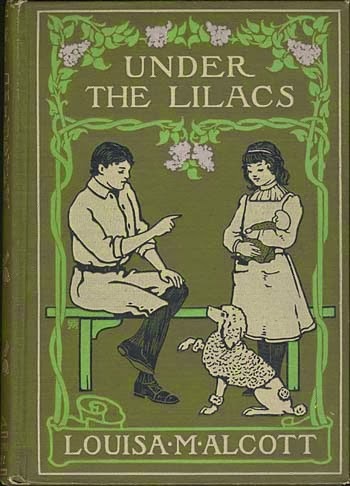 Under the Lilacs was first published in 1878, a year after the release of Rose in Bloom. It tells the story of Ben Brown, a young chap who has run away from the circus and is roaming the countryside, looking for a new home. He takes refuge in a barn where two sisters, Bab and Betty, frequently play. They discover him and take him home to their mother who provides him with housing and points him to a possible job. About the same time as Ben is working on a local farm, a young lady by the name of Miss Celia, and her invalid brother move into the neighborhood. Miss Celia's heart is pricked with tenderness for young Ben and she eventually employs him, bringing her into her and her brother's home thus providing him with a family. Just as is the case with Alcott's other books, nothing tremendously exciting or thrilling happens in this story. The book tells of the daily scrapes and adventures of young children playing with one another. It's a very calm read and pleasant. Ben is a likable fellow who proves a hard worker and throws himself into this makeshift family with a grateful heart. And yet he's not a perfect character either. He suffers doubts about his ability to prove himself worthy of the trust of Miss Celia. He doesn't feel as if he measures up to the other children in the community and he has to struggle to find ways to fit in and ignore snide remarks about his past. Also, he suffers grief over being an orphan. Yet his weaknesses just make the reader love him more and make us eager to share in his triumphs when they come. Beyond the above, I really didn't find anything notable about this book online to talk about. There is no spectacular history associated with the title as far as I can tell. So I decided to look up other happenings in the world during the year 1878. I thought you might also find this interesting. What were people listening to in 1878? Well, for one, Pyotr Ilyich Tchaikovsky's Valse-Scherzo in C major was published. The phonograph was patented by Thomas Edison. The Johns Hopkins University Press, America's oldest university press, was established. A yellow fever epidemic revenged the Mississippi Valley killing over 13,000. Carl Sandburg, American poet and historian, was born. 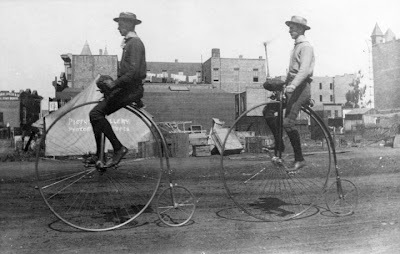 Albert Augustus Pope's Pope Manufacturing Company begins producing the Columbia high-wheel bicycle outside Boston, signaling the beginning of a bicycle craze in the United States. Just some fan facts to think about on this Tuesday before Thanksgiving. :) And that about wraps it up for me and Under the Lilacs at this time. It's a fun book if you have some time to get to it (and haven't already). I read this one ages ago - so long ago that none of the plot line rang any bells. Sounds like I need to reread the LMA books I have on hand again! I'm glad you were able to find it online to read the last page! I read a novel a few months ago in which the wife tore out the last page of the book her husband took with him on a trip, to ensure that he would indeed return home! Only time I've ever heard of doing that.